I-Browse Browser - Update March 6, 2006. Download Demo - Update January 28, 2006. Download any file from the internet and save it on your hard drive. Blogging Utiltiy - New June 15, 2003. Create and maintain a daily blog, including FTP upload capability. 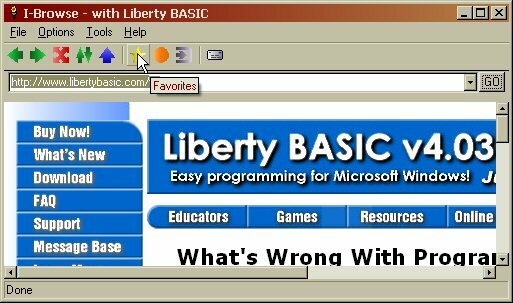 The information and code on this site is provided free of charge by Alyce Watson for Liberty BASIC programmers. You may use it freely for your own programming projects but you may not re-sell or distribute the original files or the source code. Do not copy these files to a collection, such as a CD-ROM archive. Do not place these files on another web page without the author's permission. Do not post these files to a bulletin board or eGroup. Thanks.